NOTE: In 2001 my students and I began to post interviews that we had conducted with World War II veterans at our school website, http://www.hfcsd.org/ww2/Two of our veterans had described this incident, and one of them had taken photographs of it. Four years went by, and we heard from a grandmother in a far away country who had been a seven year old girl aboard this train. Then more survivors began to contact us, and today we are aware of over 200 survivors who have now made contact with each other and their liberators through the efforts of this school project. We have organized several reunions for them. This story takes place in the closing days of World War II, asAmerican and British forces pushed into Germany from the west and the Soviet Red Army closed in from the east. On the morning of Friday, April 13th, 1945, the US 9th Army was fighting its way eastward in the final drive through central Germany toward the Elbe River. 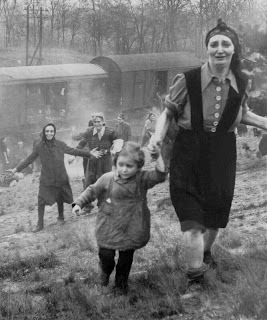 A small task force was formed to investigate a train that had been hastily abandoned by German soldiers near the town of Magdeburg, Germany.The boxcars were filled with Jewish families that had survived the infamous concentration camp at Bergen-Belsen and were now being transported away from the advancing Allies to another death camp location.Scores of children were among the prisoners. Two tank crews were charged with guarding these newly liberated people until the tanks could be relieved and the people could be properly cared for. By the afternoon of the 13th, one tank alone was responsible for safeguarding 2500 refugees. A small guard of emaciated Finnish soldiers who were also liberated that day set up the perimeter guard. The American tank commander had a small Kodak camera. He took several photographs that day of the newly freed men, women and children and spent some time talking to them through one of the survivors who spoke English. The following morning he was relieved, but the events of that day were never far from his thoughts. Later, he wrote them down for posterity, and filed them away with his photographs. Sixty-plus years after the event, survivors all over the world who had been children aboard the death train are finding their rescuers’ narratives and photographs of the day of their liberation near Magdeburg in 1945 on an oral history website produced by a high school teacher, Matthew Rozell,and his students at Hudson Falls High School in upstate New York. Liz Bishop of CBS 6 Albany came up to our school twice to interview me and the students. My school principal (who, along with Dr. Gross, wrote a letter of recommendation for me) told me on April 10th that I am one of 14 teachers in the nation who will be attending the United States Holocaust Memorial Museum Teacher Fellowship Program this summer! The Museum called me later in the day to congratulate me. Her interest was piqued by the AP article below that appeared on March 27th. Several Holocaust survivors plan to attend a reunion of the American army unit unit that liberated them from a Nazi death train 63 years ago. And a high school history teacher from upstate New York played a key role in reuniting the survivors and the veterans. 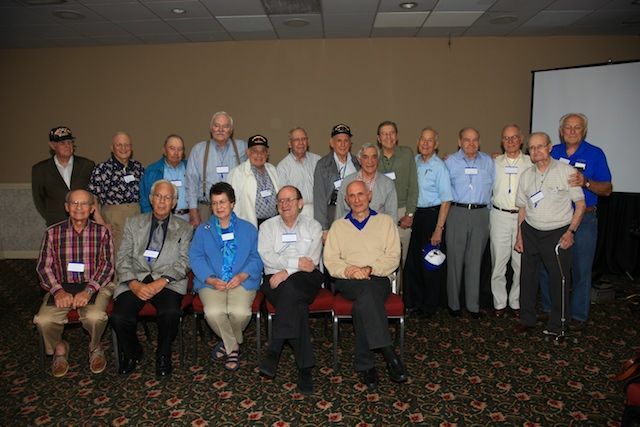 Teacher Matt Rozell’s class project on World War II led to a reunion at Hudson Falls High School last September between several survivors of the train and an upstate veteran who helped liberate them. Rozell says news stories about the reunion have led about 20 other survivors to contact him and offer their stores for his school’s World War II Web site. Rozell is headed to Fayetteville, North Carolina for Friday and Saturday’s reunion of the 30th Infantry Division. Members of the unit’s tank battalion liberated the 2,500 Jewish prisoners from the Nazi train. Rozell says the train survivors attending the reunion include a man who emigrated to America and went on to serve as a U.S. Army Ranger.